Salmon is one of the most nutritious types of fish that offers several health benefits. Rich in omega-3 fatty acids, vitamin B12, and other essential nutrients, salmon is wonderful for hair and skin health. The great taste and excellent health benefits of salmon make it one of the most loved fish in the world. Salmon is a popular oily fish that contains good fats. This makes it good for heart health and cholesterol. A good amount of protein, vitamins, minerals, and omega-3 and -6 fatty acid content contributes to overall health. Considered a superfood, the nutrition facts of salmon include antioxidant elements like selenium and other minerals like phosphorus, zinc, and potassium, as well as the vitamin B group—riboflavin, niacin, thiamin, B6, folate, and B12. Therefore, salmon aids in good health, as it makes up for most of the mineral and vitamin deficiencies in our body if we make it a part of our diet. Is salmon healthy? It is a fair question given that salmon is an oily fish with a rich amount of fats. However, this fat is completely healthy and is good for the heart and skin. Salmon is an excellent food source for the heart and brain. Medical studies have found that taking 0.45 to 4.5 grams of omega-3 fatty acids can significantly improve heart function, lower blood pressure, and reduce inflammation. The fish also contributes to cognitive health due to the presence of DHA—a type of omega-3 fatty acid. It is worthy to note that wild salmon contains more nutritive value than the farmed ones. The farmed salmon are raised on an artificial pellet-based diet, rather than their natural diet consisting of crustaceans, flies, and smaller fish which they would otherwise consume in the wild. As a result, eating salmon from a hatchery will not benefit you as much as consuming the wild-caught salmon. Here are the 12 health benefits of salmon. Salmon is a rich source of omega-3 fatty acids (EPA and DHA) and potassium. The omega-3 and -6 fatty acids combined with potassium greatly contribute to heart health, as they reduce artery inflammation, lower cholesterol levels, and maintain blood pressure levels. Potassium helps to control blood pressure and prevent excess fluid retention. Thus, regular salmon intake can significantly reduce heart-related medical conditions, including heart attacks, strokes, arrhythmia, high blood pressure, and high triglycerides. Salmon is a good source of protein. In addition to essential nutrients, our body requires protein as it is the building block for bones, muscles, cartilage, skin, and blood. It helps the body to build and repair tissues after an injury, protects bone health, and maintains muscle mass during weight loss. It also maintains a healthy metabolic rate and improves bone density and strength. Salmon is rich in the entire vitamin B group—B3, B5, B7, B6, B9, B12, and so on. Vitamin B complex plays a pivotal role in maintaining a healthy balance of all bodily functions. The B group of vitamins work co-dependently to turn consumed food into energy, create and repair DNA, and reduce inflammation. Among all the B vitamins, salmon is richest in vitamin B3 (niacin) and vitamin B6. Vitamin B3 helps to lower cholesterol levels, whereas vitamin B6 improves brain health. 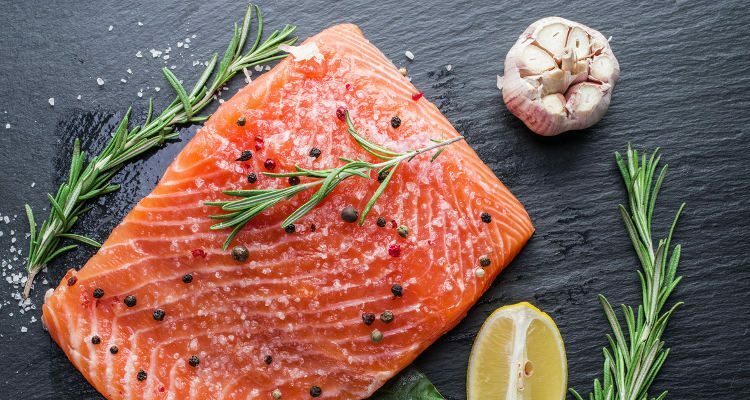 Salmon also has a good amount of B12 which is vital for the functioning of the brain and nervous system, hormonal balance, and several metabolic functions. One of the important functions of selenium is to maintain proper thyroid function. A decent portion of salmon can provide a considerable amount of selenium. This essential trace mineral protects the thyroid gland from oxidative damage caused during the synthesis of the thyroid hormone. The cells of the thyroid gland produce hydrogen peroxide which is used to make the thyroid hormone. The high levels of DHA work in association with the vitamin A, vitamin D, and selenium in salmon to boost and improve brain function. In fact, omega-3 fatty acid supplements are used to treat psychological disorders like Alzheimer’s and Parkinson’s disease. Eating salmon during pregnancy can assist with improved fetal brain development and health. Based on the impressive omega-3 fatty acid content, salmon is considered as a superfood. Medically, it is proven that omega-3 fatty acids can have a profound effect on cancer cells and kill tumors. Certain cancer conditions like skin cancer, prostate cancer, colorectal cancer, liver cancer, UVB-induced skin cancer, and brain tumors may be treated and prevented with omega-3 fatty acids. Again the omega-3 fatty acids in salmon help to reduce various inflammatory joint conditions including osteoarthritis. Salmon contains a group of small proteins called bioactive peptides. One such bioactive peptide, called calcitonin, is known to increase, regulate, and stabilize collagen synthesis in human osteoarthritic cartilage. Since salmon is good for brain health, expecting mothers should eat salmon to build cognitive skills and learning capabilities in children. It should also be included in the diet of growing children, as salmon can also help to curb ADHD and enhance academic performance. The pink color of the salmon comes from the presence of astaxanthin, a member of the carotenoid family of antioxidants. Unlike other carotenes and carotenoids, astaxanthin doesn’t get converted to retinoid in the human body. It is an antioxidant by nature and is good to prevent cardiovascular, immune, inflammatory, and neurodegenerative diseases. Incredibly rich in omega-3 fatty acids and vitamin A, salmon is a wonderful food source for eyes. Regular salmon consumption could help to cure dry-eye syndrome and age-related macular degeneration (AMD) symptoms. Salmon may benefit weight loss as well. The oily fish is protein-rich with a low-calorie content. Therefore, it is absolutely healthy and advisable to include salmon in your diet plan, as it will not only provide you with huge amounts of protein but will also compensate for various vitamin and mineral deficiencies in the body. The fat content in salmon is mostly good and doesn’t make you gain weight. As we all now know, salmon is a powerhouse of proteins, vitamins, and minerals. These are the nutrition contents present in a wild salmon that is cooked. This fish is a total package of nutrition. The skin of salmon is edible and is as nutritious as the flesh of the fish. As a matter of fact, salmon skin is richer in omega-3 fatty acid content than the flesh of the fish. It also contains a good amount of phosphorus and potassium. The flesh of salmon lacks vitamin D. But salmon skin, and particularly the bones, are loaded with vitamin D. Therefore, consuming salmon skin helps in the absorption of calcium, and consequently promotes healthy bone development. Salmon skin doesn’t have any side effects. Eating salmon skin will only increase the level of omega-3 fatty acid supply from the fish. The more omega-3 fatty acids are added to our diet, the better it is for our health. This is because it boosts the anti-inflammatory abilities of the body, and improves brain health by repairing brain cell damage. However, it is advisable to eat the skin of wild-caught salmon rather than those of the farm-raised ones. This is because the skin of the farmed salmon might be contaminated with pollutants like polychlorinated biphenyls (PCB), pesticides, dioxins, and mercury. A study conducted by the Indiana University revealed that farmed salmon have a higher concentration of contaminants than the wild ones. Another important thing to note about salmon skin is that the cooking process doesn’t affect the nutritional value of the skin. Thus, you can have them grilled, fried, baked, or whichever way you want, salmon skin is delicious and healthy either way. Contrary to popular belief, salmon is not fattening. As a matter of fact, salmon actually aids in weight loss. Health experts recommend to include a good amount of vegetables, lean protein like fish and chicken, and fruits in a weight-loss diet plan. Salmon contains a good amount of lean protein, which works in favor of weight loss. This is because proteins tend to keep you feeling full for a longer period, keeping the blood sugar level balanced. As a result, it keeps you satisfied, thus reducing your food intake throughout the day. you can safely eat two portions of salmon in a week to get the required amount of nutrients. According to the studies published by the International Journal of Obesity and The American Journal of Clinical Nutrition (May 2007), a fish (lean protein) diet with regular exercise will provide you with improved and more rapid weight loss results than just working out in the gym. Furthermore, salmon is low in calorie content. A serving of 198 grams of salmon will provide 14% daily value (DV) of calories. A three-ounce serving of coho or sockeye salmon has only 118 and 144 calories, respectively. I have two fillets a week of wild caught western Alaskan river Sockeye salmon. Those are the least contaminated with heavy metals, and don't stray into more polluted N. Pacific waters. The canned salmon I was ordering for several years fell on the list for being fed GMO corn, so then I realized it was farmed salmon. It's also good to buy from sources protecting the species, which is heavily regulated, but $8 per portion delivered, two dozen fillets with skin on per 10 pounds, so it's about the same price per serving of a ribeye steak, far healthier. That list of benefits is growing way beyond what it was 10 years ago. I enjoy salmon occasionally but do not usually eat much meat or fish. Wild vs Farmed Salmon: Which Type of Salmon Is Healthier? NASA disclaimed a certain usage of their map displaying how far reaching a tsunami in Japan reached out. It ought not be used to predict radioactive poisoning of fish, which is a much slower process than a tsunami wave. As far as Hawaii's monitoring goes, there was no effect on fish yet, nor any significant radioactivity in their waters, and as no regularly consumed fish species swim from Japan to the N. American Continent and back. No Pacific NE salmon are showing radioactivity or its effects. Japan's waters 100 miles out are another possibility. If there's any remaining distrust, there are radiation contamination detection strips & cards available. Yes, wild caught is healthier. Americans have a choice. A fine beef steak costs about as much as a wild caught sockeye salmon fillet. We know the hazards of too much red meat consumption. Rather than eat my long-time customary 2 steaks a week, I consume 4 salmon to 1 beef now, and when I upgrade my chest freezer I'll be buying sockeye in larger quantities, reducing the costs per ounce to the level of pork. The deal about sockeye salmon is that the variety "kokanee" doesn't spend much if any time in saltwater. They are caught as juveniles, inland Alaska rivers and tributaries. That variety is not farmed as far as I know. There was a particular small river source that tested a little higher in heavy metals due to a mining operation upstream on the border, which the indigenous tribe affected saw corrected by the US and Canada agencies. Probably the added pollutants in "Atlantic" farm raised salmon are not significantly more harmful, but the S. American farms are not well regulated. They use a lot of GMO feeds derived from corn. I prefer salmon feeding on entirely wild food sources, primarily insects and crustaceans. I fish freshwater species here, targeting species eating like salmon, primarily crappie and walleye. I tolerate some small-mouth and large-mouth bass, which feed a little higher higher on the food chain, but still all natural. I like the idea of "Farm to Table", but prefer "Nature to Table", avoiding all GMO sources. Genetically modified anything is possibly not a good or even acceptable idea, except to fill a world of empty stomachs. Wet a hook and catch a probably healthy source of protein. Well, except in the Potomac River where some fish are now terribly contaminted by estrogen discharges from sewer systems. Some fish there are showing up with both genders. Ummm. A Geiger counter wouldn't detect the tiny amounts in a fish fellet. You have to wrap a fillet in a pouch with a special card protected from atmospheric contaminants, and read the card a month later. I tested my cherished heirloom WW2 aviator's watch that glowed in the dark regardless of light charging, and decided not to keep wearing it. My uncle wore it when flying a glider into France to bring aid to the resistance. Too late. I now have a clock faced "tattoo" on my left wrist.. No problem at age 74, Jesus forgiving my ignorance, beginning with allowing the part holding the band rotting off. Well, I dug for about ten minutes and found this....I've reached the point that when government says something, I believe exactly the opposite...Obama stopped testing the waters within a month of the Fukushima accident. Then he told us there is no danger...Go figure. He was a prophet and we didn't even know it....a false prophet. Anyway, what did i dig up? This can be the start of your search unless you like to gamble. Fukushima: The Extinction-Level Event That No One Is Talking About ! In 2011, A massive earthquake of 9.0 magnitude struck just off the coast of Japan, triggering a devastating tsunami, which left parts of the country in shambles. Official reports claim that 15,891 people lost their lives, 6,152 were injured and 2,584 were reported missing. Japan is a nation full of nuclear reactors which produce almost 30% of the nation’s electricity. The majority of operable reactors are located across the coast, in one of the most seismically active areas of the planet! The devastating tsunami caused complete devastation of three of the six nuclear reactors at the Fukushima Daiichi facility, the cores of which melted withing the first three days. The destroyed reactor sites have been dumping hundreds of tons of radioactive waste into the Pacific Ocean, every single day for the past four years, the results of which are obvious. Radioactive cesium rapidly contaminates and ecosystem and poisons the entire food chain, and this waste offshoot has been detected in Japanese food supplies over a 200-mile radius of the Daiichi facility. Cesium along with other radioactive waste products are bio-accumulative, meaning they accumulate in an organism at a rate faster than the organism can eliminate it. The Japanese government and TEPCO have of course, lied about the amount of radioactive waste that has been leaking into the Pacific. TEPCO has admitted that between “20 trillion to 40 trillion becquerels of radioactive tritium may have leaked into the sea since the disaster.” Since it’s been shown over and again, that TEPCO repeatedly lied and covered up the true extent of the disaster, that number is most likely far greater. It has been claimed that decommissioning the plant by 2051 may be impossible without huge leaps in technological advancement. It has also been estimated that the plutonium fallout has been 70,000 times greater than Hiroshima. Have you ever heard any of this discussed by the mainstream media? I know I haven’t, it is all one huge cover-up! TEPCO has repeatedly lied and covered up the true extent of the disaster. Childhood cancer rates, particularly, thyroid cancer. Official sources have said repeatedly that there is no danger from the leaking radiation, but the environment would beg to differ. Sea life all along the west coast of the United States has been dying in alarming numbers, and many fish and sea creatures tested off the west coast have shown extremely high amounts of radioactivity, amounts that exceed the safety limits. In 2013, the Huffington Post reported that massive amount of krill washed up along the west coast in a 250-mile stretch from Oregon to California. Krill is an essential part of the ocean’s food chain. When marine life on the low end of the food chain begins to die off, the larger animals that feed off the marine life starve to death. Massive amounts of starfish (See also in Europe in 2017) have appeared along the west coast that have literally turned to mush. USA Today reported it, but of course they claim that no one knows why. It might have something to do with the fact that the Pacific has become a toxic, nuclear waste dump? 98% of the sea floor of the Pacific is covered with dead sea life. But of course, global warming takes the blame by default. Truthfully, nobody knows how to contain the radioactive leaks, so the Japanese govt. and TEPCO do the next best thing, they lie and downplay the real dangers. The time for humanity to collectively wake up and come together is here and now. We cannot put off this mess, and leave it for future generations to clean up.